"3LA1, V-2013" by Timothy K. Perttula and Robert Z. Selden Jr. CONTEXT INFORMATION: From a grave (Burial 1) in Burial Plot 3 (Martin 1939). Associated with V-2007 to V-2012 in the grave. 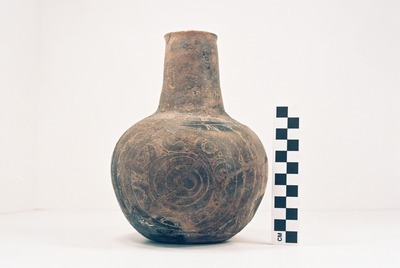 DECORATION: This bottle has a complex engraved design organized in four panels on the vessel body. Along the upper part of the body is a narrow horizontal band filled with hatched or cross-hatched brackets. Two of the body panels are rectangular and vertical in orientation and have the same engraved motif, while the other two body panels are circular engraved motifs and different from each other. The rectangular panels feature bounding curvilinear engraved lines with hatched pendant triangles, followed by two vertical engraved lines, and two narrow hatched ladders. The central element in the rectangular panels is a rectangle with upper, central, and lower hatched brackets. The negative space created by the brackets has two small and vertically-oriented engraved rectangles. The first of the circular panels has concentric circles bounded by two sets of two opposed semi-circular engraved lines. One of the outermost bounding lines has hatched pendant triangles facing outward away from the center of the panel. Within the bounding semi-circular lines are five concentric circles; two of the outer circles form a circular zone filled with small hatched brackets and simple semi-circles. The second circular panel panels has concentric circles bounded by two sets of two opposed semi-circular engraved lines. The outermost lines have hatched pendant triangles that point inwards towards the center of the panel. Within the bounding semi-circular lines are seven concentric circles, with two of the outer circles forming a circular zone filled with small hatched brackets and seven small hatched or simple semi-circles. Handy Engraved bottle (5425-664): a, circular panel; b, rectangular panel.